Floating vanities remain overwhelmingly popular. They bring a sense of space to bathrooms big and small. They also allow for greater design options – here are 5 examples that show the potential of the floating vanity. 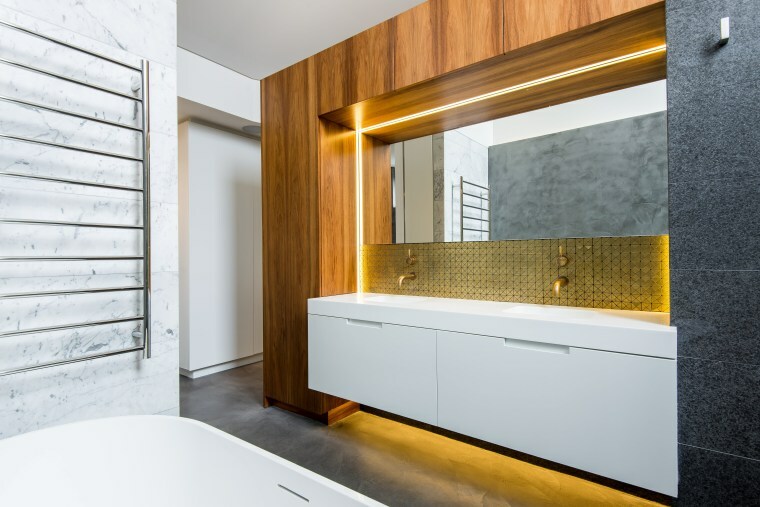 The white floating vanity is underlit, adding to the sense of space in this project. Keeping focus on the high, raking ceiling over the bedroom and bathroom led to this master bedroom space being left as one large room. A privacy wall which acts as a divider provides the vanity niche on the bathroom side and hidden storage in the bedroom. Up-lighting in the freestanding wall further accentuates the sloping ceiling and provides ambient light to both areas. 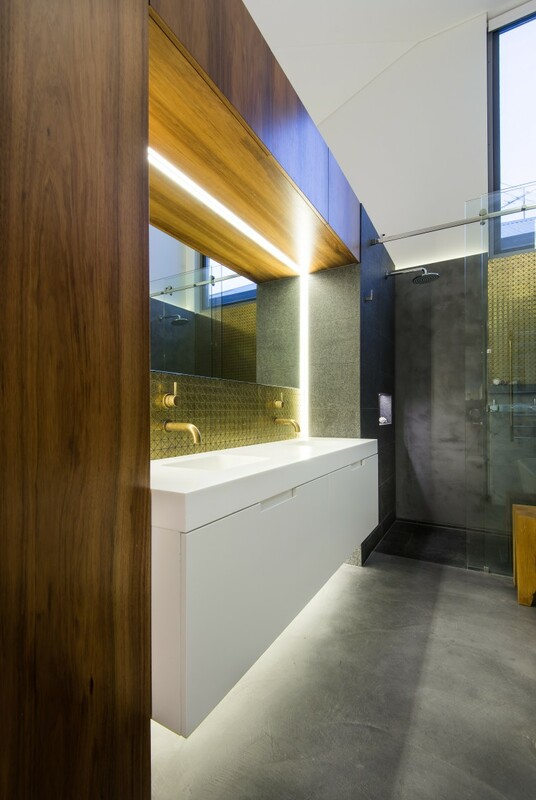 The white floating vanity is also underlit, adding to the sense of space in this project. A brass mosaic tile that lines the back of the shower's niche is seen on the vanity splashback, and the use of brass is continued in the basin mixer and spout, integrating these elements. This floating vanity's use of mirrors plays up the contrast between old and new. 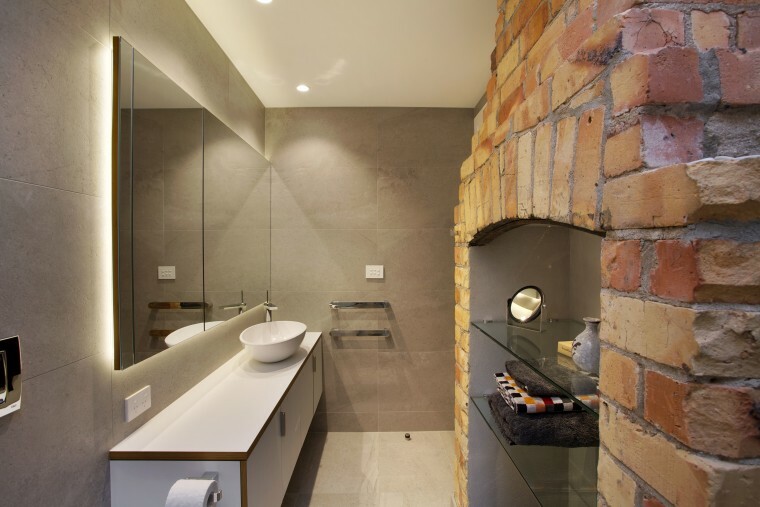 The brief for this heritage renovation was to create a modern ensuite and walk-in robe in the original two-bedroom space, while at the same time respecting the character of the terrace. Typical for a heritage project, the renovation required the ability for the changes to be reversed so the room can be converted back into a bedroom in the future, if required. 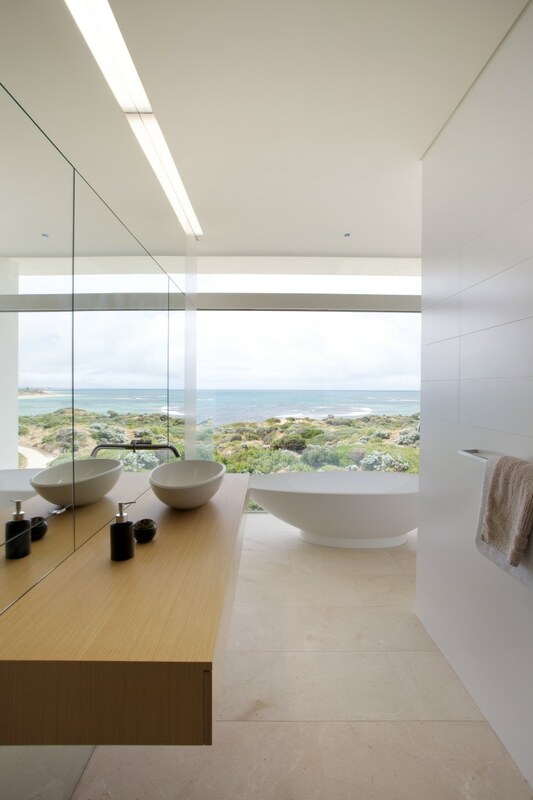 To achieve this, the bathroom was designed as a central pod insertion clad in mirrors. The mirrored surfaces make the bathroom disappear to the eye, and also reflect and effectively double the period detail all around. The use of mirrors also plays up the contrast between old and new and celebrates the period detail in myriad reflections at the same time. 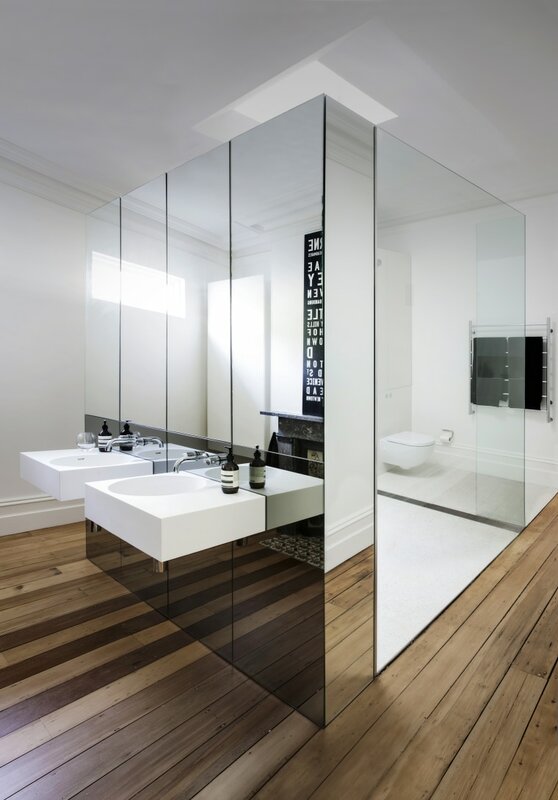 With the mirror wall above and below, this double vanity appears to be cantilevered across the room. This master suite's bathroom follows the bedroom's lead by remaining open to it's scenic outlook, while still maintaining a sense of privacy. The generous shower stall has one blade wall in black satin glass on the bathtub side, and is screened from the vanity on the other by a wall in textured tile. Another bank of cabinetry shields the vanity from the dressing room, which can also be entered from the other end of the suite. Storage was important but the designers didn't want a cluttered effect. To avoid this, cabinetry space is seamlessly built into the timber veneer vanity and the wall separating the dressing room from the bathroom. The same timber finish also runs across the ceiling formwork at the end of the bathroom. This frames the floor-to-ceiling mirror behind the vanity, and helping to draw the room together. The wall-height mirror behind the vanity makes this expansive room seem even larger, and also maximises natural lighting. Floating vanities in the guest bathroom's keep don't obstruct the views. The floating vanities in this home's guest bathrooms are intentionally minimal. This helps to keep focus on the homes impressive views. They also reflect the home's cabinets, which were designed to have a sense of floating. The floating cabinetry was itself inspired by the home's cantilevered balconies and roof line. The storage in this ensuite bathroom is on a side wall, allowing the vanity to be reduced to a simple, open structure. A floating vanity can also be found in the home's master ensuite, as the storage is on a side wall. As a result, the vanity can be reduced to a simple, open structure rather than the usual box-like design. Because of local heritage requirements, the architect decided it was easier to keep the fireplace and incorporate it into the master suite's design. Futura plywood with an exposed endgrain defines the edges of the floating vanity. The woodgrain has a subtle warmth that complements the exposed brick of the nearby fireplace, which now incorporates glass shelving. This furthers the suite's juxtaposition of light versus heavy and modern versus traditional. 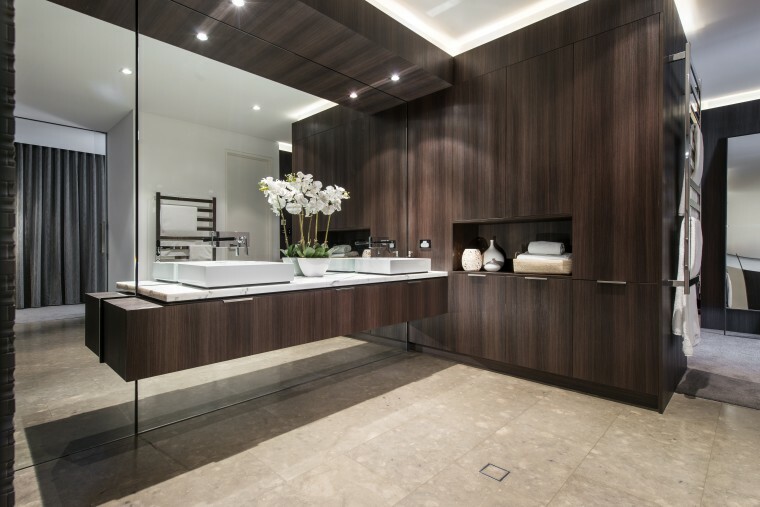 The backlit mirror adorning the vanity also adds dramatic impact to the space and helps to add modernity to the space.